I ate well last week. So well in fact, that I think I even gained a few pounds. My meals covered a wide culinary spectrum from full-on vegan to a Mexican breakfast, to an Italian meal that brought my family roots right to the surface. All 3 of these restaurants were new to me, they were all very different, and all worthy of a return visit! I am not a vegan. I could live without red meat if I had to, but dairy products (including my beloved cheese) hold a very special place in my heart. That being said, I have several close friends, and even my husband at times, who’ve made this dietary commitment. Unfortunately, if you’re vegan, eating out can be quite challenging. If you’re tired of having to read every detail of every menu or having to explain your entire life story to the server, Good Karma will make your life very simple – everything on the menu is vegan. After sampling the Chimichurri Style Seitan Sticks, the Crispy Baked Tempeh Buffalo Wings & the Loaded Nachos (which were amazing), I decided to play it safe and get the “Pad Thai” for my entrée. I have to say that I enjoyed it more than my usual “Thai” Pad Thai. It wasn’t as spicy as I usually like, but it was loaded with vegetables (carrots, cabbage, celery & broccoli) and the peanut tamarind sauce was delicious. Topped with toasted peanuts & beautiful, fresh sprouts, I tried not to feel too guilty about the huge mound of stir-fried rice noodles I also consumed. My “vegans” enjoyed their meals as well… oohing and aahing over every bite. The only thing Good Karma could improve upon is the ambiance for a nicer in-house dining experience. It’s quite small, but lacking a “cozy” feel. The take-out business was definitely booming though, so maybe that’s the better way to go. What better place to bring your mom to breakfast than a place called Meemom’s? This was actually the 3rd time I’d tried to eat here, apparently always stopping in at their busiest hours (like on Saturday mornings). This visit with my mom was on a Thursday around 10:30am and luckily we got right in without a wait. It’s popularity must be due to its extensive, home-cooked breakfast menu (there are 22 varieties of French Toast) & its diverse selection of salads, paninis & wraps for lunch. I had a hard time narrowing it down, but finally decided on the “Pico de Huevos” – a version of the Mexican dish, huevos rancheros, that sounded delicious. The perfectly poached eggs were served on a grilled cornbread muffin & topped with a chipotle hollandaise sauce. Add chorizo, pico de gallo & sliced avocado to create an amazing combination of flavors and textures. And the side of “spuds” were a pure bonus… who doesn’t enjoy a crisp pile of salted chips? Meemom’s is a definite winner, although I have to add that it took over 30 minutes for our food to arrive and like I mentioned, there is oftentimes a substantial wait. Hopefully you can time it right & enjoy this great breakfast & lunch eatery. I think I saved my personal favorite for last… Capitoline is the Italian offering in the new “Complex” that has recently branched out from the original Bond Street Bar in Asbury Park. This new, 2 level structure creatively takes up the space of a city block with 3 interconnecting restaurants and 4 bars. Bond Street is still alive & well, serving their delicious burgers & sandwiches in a classic, corner bar atmosphere. Loteria, with its main entrance on Mattison Ave, is a new Mexican taqueria, brought to life with the help of Asbury’s own, well-established Mexican restaurant, Plaza Tapatia. On this night, however, we were drawn into Capitoline, with its enormous roll-up windows framing the immense wooden door on Cookman Ave. Inside, an open design, family-style seating & a roaring pizza oven complete the rustic look. The Italian menu features apps, salads, meatballs and pizza, available in big square slices or full pies. We started with the Antipasta – a full board of Italian meats, cheeses, bread, olives and roasted peppers. I was in heaven. Next, we went with the “Agrodolce” salad – a delicious blend of baby lettuce, arugula, radicchio, roasted beets & goat cheese with a balsamic vinaigrette – delish. And finally we succumbed to the pizza… the classic Margherita which we jazzed up with some spicy Italian sausage – perfecto! Add a few beers and the meal was complete – I cannot wait to go back!!! All 3 restaurants in The Complex offer reasonably priced menu items, which is often hard to find in this downtown strip. The layout is innovative & clever, with doors or halls connecting the separate venues, but with each still embracing its very distinct space & unique theme. The architecture includes salvaged pieces & building materials from many of Asbury’s most historic landmarks, including the Paramount Theater. “Eat well. Spend little.” is their tag line & it truly fits the bill. This spot is definitely worth a trip, especially if you can get here before the summer crowds hit! Always enjoy every bite & sip!!! Gelato… Wine… & Cheese… Oh My! So my favorite gelato spot in Asbury Park has just gotten even better! 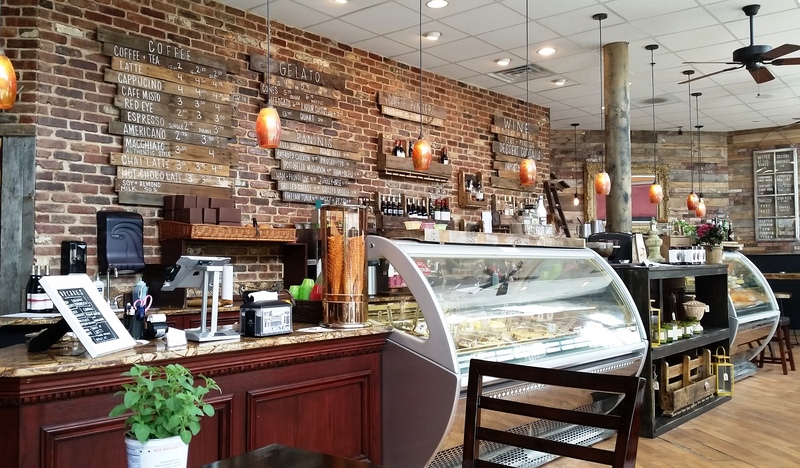 “Lola’s European Cafe” (formerly Casa di Dolce) on Cookman Ave, is now serving their authentic Italian Gelato along with… wine, cheese, specialty cocktails, whiskeys, coffee, paninis & desserts… all in a beautifully redone, rustic retreat. Taste buds beware… it’s all amazing! And it’s gonna be a hot spot this summer, with seating both inside & out. So get in now before the crowds take over! 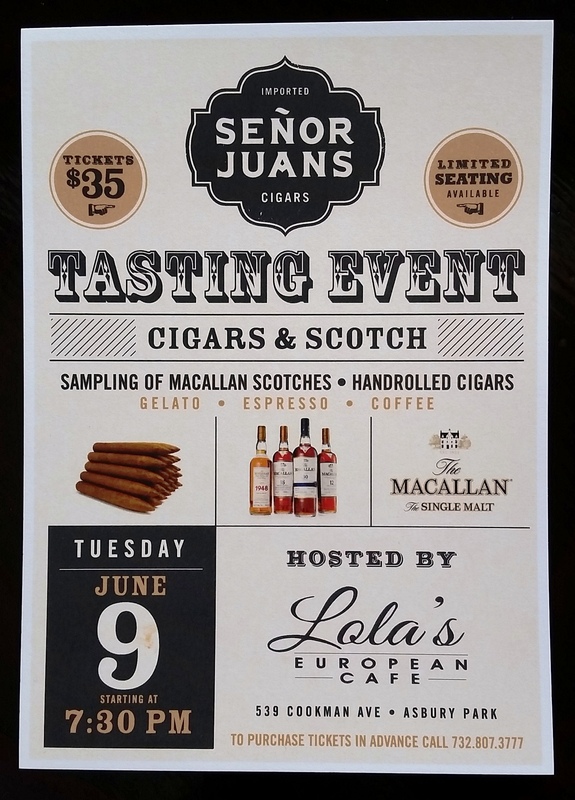 And for the whiskey lovers, check out this great event coming up on June 9th!